Fig. 1	- An E-commerce Quarterly report from Monetate (Q2, 2014) shows e-commerce basic metrics such as conversion rates and average order value across different platforms. Fig. 1 – An E-commerce Quarterly report from Monetate (Q2, 2014) shows e-commerce basic metrics such as conversion rates and average order value across different platforms. The e-commerce effect on the market can be described as that of a river in a desert previously served by water tank trucks. Imagine. To have some water you had to wait the tank truck to pass by, patiently queuing carrying your empty glass or bucket and then to negotiate for a decent price. Now, anytime you can just walk anywhere down the river and effortless fill the glass you need that very moment to drink. Accessible, convenient and simple. The example is meant to depict the consumer expectations: whoever can faster match them first win the market. Any possible tool that might serve in this direction is greatly desired. 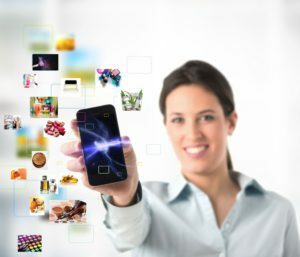 It is the Eldorado of app developer: a new and young generation of entrepreneurs focused on virtually reaching people and disrupting the occasion of use concept. Absolute Accessibility is the must. That is the target for all mobile device and the driver for technology innovation in the field. Let us go back on real data to understand the state of the art. In its last Global E-commerce Report, Nielsen surveyed 30,000 online consumers in 60 countries to reveal consumers online browsing & buying habits. Global online sales reach € 1 trillion and mobile e-commerce sales strikes € 48 billion at the end of 2014: less than 5% in value of the online market. A large share of online purchasing refers to durable and entertainment-based categories while fast moving consumer goods are showing an interesting tipping up sine a couple of years. 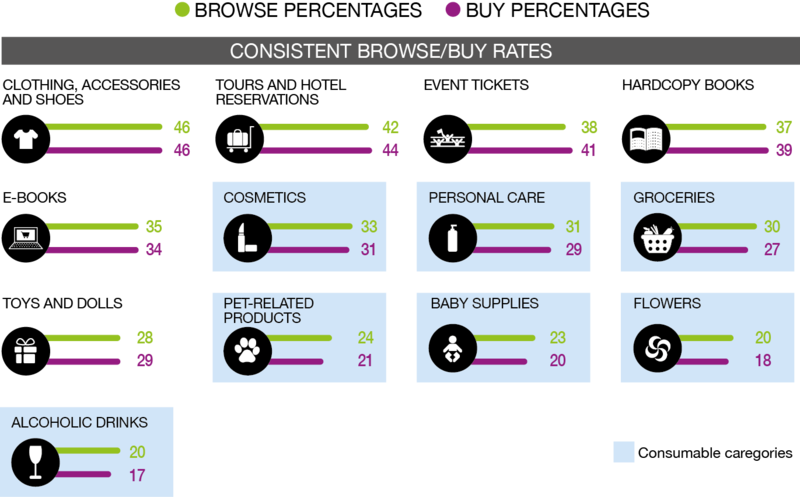 In said category, Beauty & Personal Care is among those showing a stronger increase over the online channel. Marking a +6% in the last two years, the online B&PC sales are valued € 4 Billion and growing, representing about 6.5% of total sector. 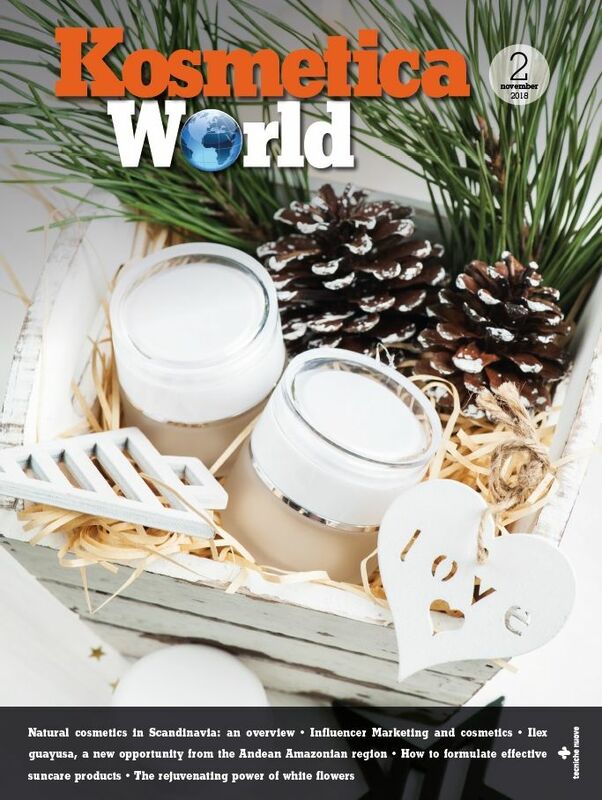 A.T. Kearney reports that almost half of people involved in the survey declared they purchased more beauty and personal care products online in 2014 than in the prior year and fragrances and color cosmetics scored a +16% among frequent purchasers. Internet is an image driven channel, this supporting the evidence that B&OC category results in one of the most active online. Among online retail, Walgreens.com and cvs.com placed in the top 10 of B&PC segment, while Amazon confirms to be the most frequently shopped site, with walmart.com a distant second. On the other hand, brand-direct sites such as avon.com, loreal.com and olay.com are still playing a marginal role, this showing a large potential is still un-exploited. Computers, mobile devices and tablets running on different platforms are boosting 24/7 accessibility to a market that literally never sleeps. While Computers are still the favored device for online browsing & buying, mobile phones are fast catching up most probably to become the first e-commerce tool by 2017. As per today, the overall mobile conversion rate is still poor. Nonetheless, emerging markets as Middle East/Africa region show a preference to mobile devices, being often the first-access to the Internet. Reversely, tablets did not penetrate the market as much, yet (only 31% of internet active people in emerging markets declared to use a tablet for online buying). On the other hand, America and Asia-Pacific regions still report a large majority of consumer shopping from computers (over 80% of online shopping activists), closely followed by Europe. Of course, the use of computer or mobile are not alternatives, but complementary. 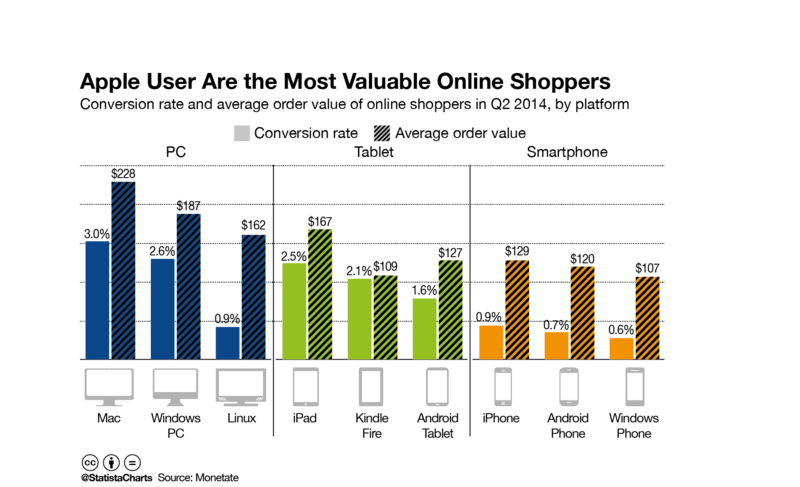 Tablet are currently less popular than other devices for shopping online. Namely, large screen and portability should support, but the penetration of these devices is in facts still low. Among mobile devices, Apple rules with more purchasing action from iPhone versus Samsung smartphones and Windows based ones and the order repeats among Tablet, with the iPad leading. Moreover, the Computers also confirm the lead of Mac users over PCs (fig. 1). Given the hardware, different software, Web-app, app of any sort are continuously popping out in the attempt to engage the consumer in an innovative purchasing experience to remember. Interaction: that is the target when addressing online clients. The shopping experience starts with the browsing: where shall the customer find the best product? Here they come the blogs, the community, the app as Pinterest, Instagram, Tumblr to name a few. Mobiles become searching tools to have a click away any possible innovation and trend. Novelties spread within millions of people in hours and become commodities in no time. Mobiles turn each customer into a source of information, an editor and a content generator. Despite the global approach, app are a very sophisticated and target tool. If you search for convenient product, last fashion call or exclusive piece of luxury consumables, you are looking at different apps. The tools change, but the segmentation principles stay, indeed. After the browsing, it comes the buying. 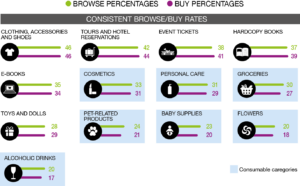 Among consumables e-commerce, cosmetics show an almost one to one browsing/buying ratio. According to Nielsen findings, when 33% of the respondents declare to browse, 31% declare to buy (Fig. 2). A new challenge in the mobile market is there: immediate accessibility to the virtual product is turning in a will, or expectation, to receive the real product in no time, literally. Same day shipping is already a standard in some online retails. That is the target: to produce on single item order and deliver. Return policy are established and expected and the supply chain must handle it accordingly. Single item tracking by RFID tags (Radio Frequency Identification) could be a solution, allowing identification of single purchase action unit. In facts, the mobile commerce does not perceive the minimum order concept, anymore. Fig. 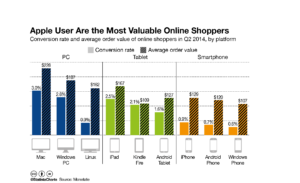 2 – Browsing & Buying ratio in most common online purchased categories. It stirred the real stores changing to become a customer-centric experience site. There, clients will try product novelties and share their experience and review across the web, on blogs, communities or social media. As per the purchasing action, clients will most probably complete it later, online, in a no stress environment. It is called «showrooming» and it is the next challenge in terms of merging virtual and real markets. In facts, this is the hot spot of the moment. One hundred percent virtual is overcame in favor of a more integrated and interactive «vireal» world. Aiming to engage and interact with the clients, cosmetic vending machine can customize your nail varnish or makeup purchasing, while interactive windows and screens will set you ready to experience the desired product 360°. Innovative clinic equipment is offered to investigate the skin and pick up the best B&PC product for the client, while a whole category of innovative tools will interact with mobile devices to customize at best the purchasing experience according to the owner last online purchasing actions. Best color cosmetics shades can be chosen after a smartphone camera driven trial, and makeup experience can be completed through dedicated app by just uploading a picture of yourself. Street shopping can be driven by silent apps voluntary activated in searching mode on specific target: when the client will become reachable by those shops offering the product desired, a pop-up advice on the item, the price and the availability in the nearest shop. While mobile purchasing channel is growing, so they are the accompanying threats. Apparently, 3% of total mobile revenue was lost for frauds in the past year and the situation is quickly worsening while number of transaction increases. A specific need for mobile protection is opening a new market opportunity especially with the advent of smartphone direct payments. Finally yet importantly, among the over one billion of online buyers, different generation show a different habits. Again, Millennials (age 21-34) are in the focus of all marketing research, being the segment with the highest spending potential for the next decade. It is the first digital generation and as expected it scores the highest browsing & buying will with over 60% of the respondent positively involved. Generation X (age 35-49) represent the second highest segment of online customers while Baby Boomers, Silent Generation and the newest Z generation are still marginally exercising online. It worth to mention that the study revealed the once the initial barrier toward online shopping is overcame, then the client stays. This is to say, there is a clear fidelity to the channel. Clearly, the increase in population age works in favor on online shopping penetration. Within this frame, different categories of customers are shaping across the age. In the Global E-commerce Report, Nielsen suggests four customer categories. The shopaholics, enjoying the online shopping as convenient and fun, are active marketer, experiencing the browsing & buying as a game and with large use of all possible engaging tools. The researchers, less charming but more pragmatic, are surfing the Web and the Social Media chasing precious information to complete the best purchasing action. The savers, fully driven by the idea that online shopping is at first the best way to find a good deal and saving money. Finally, the skeptics, as always, innovation bring uncertainties and these customers do not feel comfortable with it. To win their trust it is strategic to alleviate concerns and assure them on the secrecy of their sensible information. To develop innovative tools supporting online and particularly mobile shopping is than a complex exercise that should account for all these insights. At the end, online channel is just the technical evolution of post channel and internet is a faster and wider post catalogue. This is to say, again, the revolution is just in the tools, but the values stay. It’s the target when addressing online clients.